In stock. Order in the next 1 hour, 59 minutes and it will go out today! 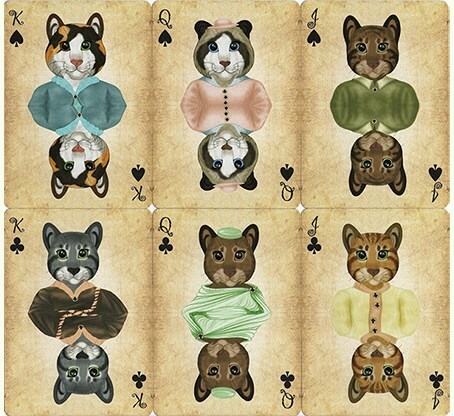 For you feline lovers out there, this is the deck of cards for you. Cats from the world over have assembled to adorn this unique deck. 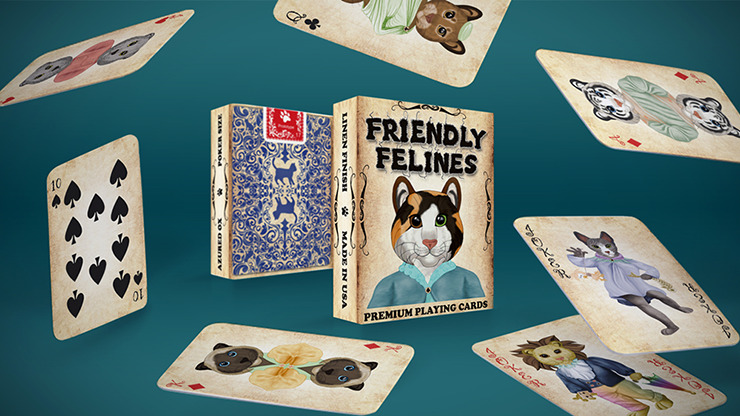 Printed by the USPCC on classic stock with an embossed finish, the card faces feature custom court cards, Aces and Jokers with a selection of cat breeds from around the world. The tuck case comes a numbered custom seal. And for magicians, there are a few extras. There are secret reveals on a Joker and the tuck case, and two Ace of Diamonds gaff cards are also included! Whether for magic or play, these cards will provide a fun visual experience for you and spectators alike. However, only 1,000 decks were printed, so get your decks before they are gone! This is a spirited and lively deck of playing cards that is cute at the same time. It has humorously and rightly been described as "the cat's meow"! The tuck box immediately introduces us to one of the cat characters that populate this deck. It also has a numbered seal (featuring a paw print), and a two of spades reveal on the inside flap. I can't say enough good things about the borderless back design. The ornate artwork really emphasizes the two cats that are silhouetted as the key feature, and the full bleed design looks stunning in spreads and when handling. My only concern is that the style doesn't seem to entirely fit with the artwork style employed by the face of the cards, but there's no doubt that these card backs look truly spectacular. 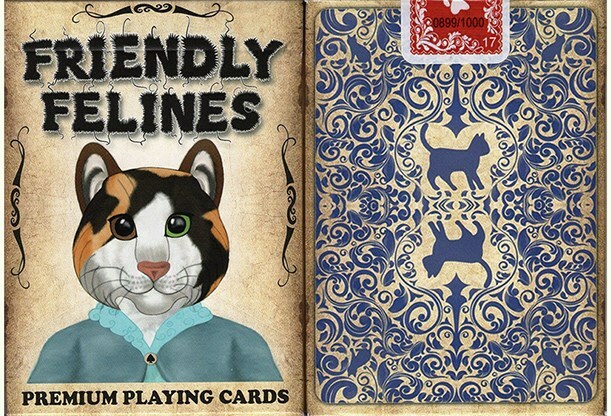 The card faces have a vintage style appearance, that looks great and works well with the artwork, while the pips are clearly customized, and the indices are clear. 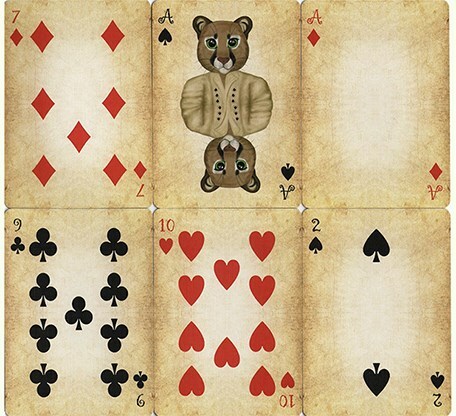 I like the fact that the Aces have been given their own identity, with heavily stylized artwork that on the one hand matches the court cards, and yet is clearly distinct from them in that they feature the great cats of the wild: Lynx, Cougar, Tiger, and Cheetah. The Jokers add more cat characters to the mix, with a Lion (the only cat with a mane), and a Sphinx (an unuxual hairless breed). 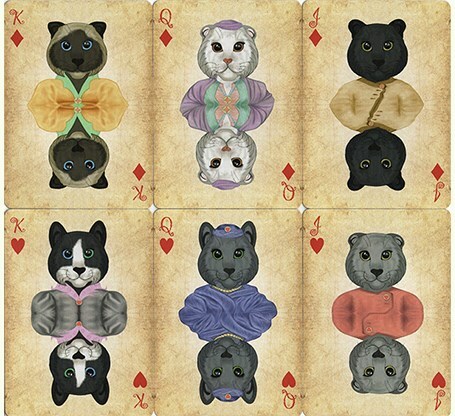 Two extra gaff cards give possibilities for magical effects involving transformations and vanishing, with two extra Ace of Diamonds, one with an alternate cat character, and the other with a blank area where the cat character would normally be.